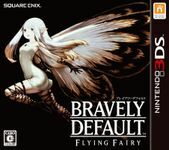 Developer: Silicon Studio, Square Enix Co., Ltd.
"Bravely Default: Flying Fairy (ブレイブリーデフォルト Bureiburī Deforuto) is a 2012 role-playing video game by Square Enix for the Nintendo 3DS, a spiritual successor to the 2010 video game Final Fantasy: The 4 Heroes of Light. The game was developed by Silicon Studio, best known for the adventure game 3D Dot Game Heroes. The game’s job and battle system are similar to Final Fantasy V. It features augmented reality in the gameplay. On April 17, 2013, the game was announced to be released in Europe in 2013 and North America in 2014. The game utilizes turn-based combat and multi-hit combination moves. The game utilizes cut scenes. There is a job system, similar to those in some other Square Enix games such as Final Fantasy V and Final Fantasy: The 4 Heroes of Light. The game has a single save slot, which Producer Tomoya Asano stated on Twitter is due to the game's "wireless features". The game will feature heavy use of voice acting within the story and during battles. Producer Tomoya Asano has said that the game will feature multiple endings. Also, thanks to an official Member's Site, the players can create a community, unlock achievements (otherwise impossible for the 3DS) and take on Quests created for the whole community." Source: Wikipedia, "Bravely Default", available under the CC-BY-SA License.